Bespoke home scents, listening rooms... how luxury developers are offering multi-sensory living. The top tier of London’s latest developments has become multi-sensory experiences. These are places that don’t just look good; they also smell, feel and – in some cases – sound amazing too. Here’s a look at some of the most memorable in 2017. The views from many of the latest central London developments are often so show-stopping, they grab your gaze the moment you enter and never let it go. Sometimes you forget to even look at the flat’s interiors at all. The very best take in a roll call of London’s best landmarks, such as the penthouses at Goodman’s Fields in the City, where the final phase, Cassia House, launches this week, with one-beds from £1.04m. Famous bridges are always a sure bet for fantastic views too, including the £2.5m show flat at Queen’s Wharf, where Hammersmith Bridgelooks close enough to touch. Combining all of that are The Corniche(prices start at £3.6m) and The Dumont(prices from £665,000), two St James developments on Albert Embankment, which have Big Ben as their local timepiece and river vistas that span a succession of bridges. In the new 31-storey Dollar Bay, it’s hard to know whether to fixate on Daniel Hopwood’s decadent interiors or the vistas of London at night as you bubble away in the Jacuzzi in the quadruple penthouse. Its name may sound like it’s straight out of Miami, but this is South Dock (in Canary Wharf), not South Beach, and there are numerous money shots for the multi-millionaire who buys this £3.2m bachelor pad. None, however, quite beats the scenes from the double-height, glass-walled room that is devoted to the Jacuzzi. It’s set up some steps just off the dining area – perfect for when dinner parties get either dull or fruity., a vast, shimmering modern chandelier cascades down the property’s three storeys. If anything can distract from what lies outside, it’s the lighting installations in top end properties. In the £21m triplex apartment at Similarly unforgettable in the £7m penthouse at The Hempel Collection - British Land’s reworking of Anoushka Hempel’s legendary 1990s hotel in Bayswater – is a £30,000 light sculpture called Flight by Haberdashery. Illuminated from above, its 500 individually-hung bone china leaves give the impression of a migrating flock of birds – and can be best appreciated from the mezzanine level that doubles up as a gallery space in these lateral apartments. In one of the penthouses at Neo Bankside, next to the Tate Modern, lighting designer Sharon Marston has ensured that it doesn’t matter what the owners dish up because every guest’s gaze will similarly be pinned to the ceiling, where Marston has suspended hundreds of red leaves on fibre-optic strands in a one-off coral and silver chandelier above the dining table. 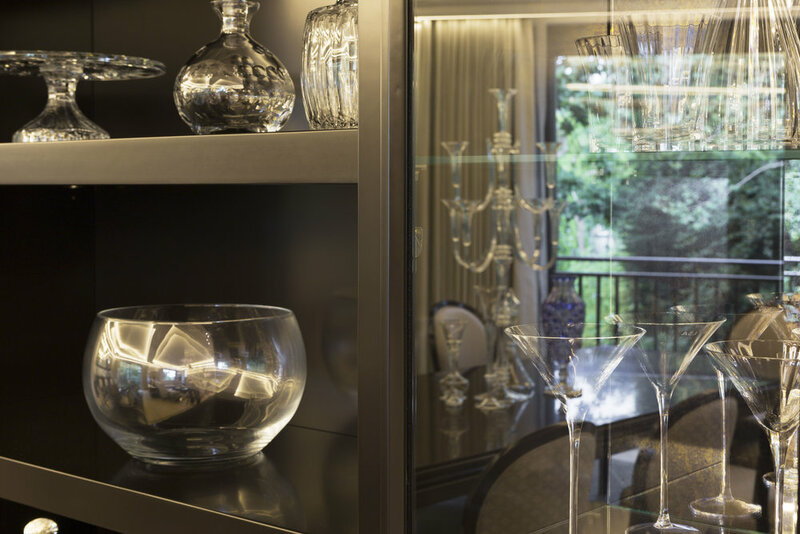 We spend more on candles than anywhere else in Europe – and smell has become a major selling point in new schemes, with many developers commissioning bespoke scents for residents.Among them are Buxmead in Hampstead, where remaining apartments cost £6.9m-£15m. The communal areas are infused with bespoke scents by Alexandra Soveral, including a particularly seductive patchouli and aged Vetiver in the screening room.remarkable church conversion in Mill Hill, on sale fully-furnished and dressed by Alexander James Interiors for £6m.The Chapel, The Berkeley Group’sAlternatively, you could get yourself a super-sized bottle of Culti Milano (£550 at Harrods), the Italian brand that invented the reed diffuser. Mighty 4,300ml bottles – that’s the equivalent of six bottles of wine – infuse the gargantuan spaces (think 90ft long living room and 45ft high ceilings). It’s surely only a matter of time before developers start commissioning soundtracks for their properties in the way they do bespoke scents. Until then, it’s left to the luxury brands to provide aural temptation. The £11.995m penthouse – now sold - at Chelsea Island comes with Bang & Olufsen BeoLab 90 Ultimate Loudspeakers, which start at around £67,000. Merlin Dormer of Heaton & Partners buying agency, who has seen a number of new homes with this latest B&O bling, describes it as “the most amazing piece of sound engineering” he has ever seen. Real music purists (or simply billionaires in search of another trophy room) are building their own acoustic sanctuaries in the form of "listening rooms". In one £80m London mansion, the technology looks surprisingly mid-century, but the specially-made speakers alone cost £1m.Others prefer perfect sound to be part of the experience in their private screening rooms. The Fitzrovia-based design company Cornflake are now building the first home cinemas in London with 3D sound to complete the full-immersion experience along with ultra high definition 4K vision. The whole package will cost from about £250,000. Cornflake have also just completed one of the world’s first in-house IMAX cinemas for £1m. Otherwise, if you want to evoke a sense of luxury through sound, get yourself a Steinway. And if – like many of the wealthy sorts who buy Steinways, you can’t actually play the piano – get yourself a self-playing one, controllable by iPad. In a new £23m development in St John’s Wood, Iggi Interior Design have used a Lalique Steinway Heliconia Spirio (£186,000) as the centrepiece. Sometimes, though, nothing can beat the sound of silence - as any parent knows. So does the odd developer. At Holland Park Villas in Kensington, where apartments cost from £2m-£16m, they’ve recruited a crèche company to keep the kids entertained with films and craft sessions on Saturday morning, while Circus West at Battersea Power Station has a weekend swimming club for kids and Lillie Square in Earls Court includes a children’s TV/play room as part of its clubhouse. All so that the adults get to sleep, work out or drink in peace. The £3.7m show flat at The Nova Building in Victoria, has been designed by Amos & Amos with “Britishness” as its theme, including one room dedicated to a trendy, modern pantry, stocked entirely with products from the cool, new purveyors at Nova Food. From here, you can watch the shenanigans of the rich and famous in the gardens of The Goring hotel across the road. At Lillie Square in Earl’s Court, buy a flat from £775,000 and you get discounts in London’s only Michelin-starred pub, The Harwood Arms, just down the road. , where just one £5.4m apartment remains, you can eye up your neighbour’s wine collection in the basement bodega – where residents can buy storage space for 336 bottles for £25,000. Reassuringly, among all the boxes of premier cru Puligny-Montagny pushed to the front, there was sign of refreshing disregard for wine snobbery – a bottle of £10 Marks & Spencer prosecco.